The earliest recorded evidence of curling in the Okotoks area dates back to the January 31, 1901 edition of the Calgary Herald. The article stated that an annual competition was played between two teams from Fish Creek and Sheep Creek. At that time, the Okotoks settlement was known as Sheep Creek, and it’s probable that curling took place on rivers. In 1912, two sheets of ice adjoined an indoor skating rink on the NE corner of Northridge Drive and Elizabeth Street. In 1918, this facility burned to the ground, and another was built at the same location in 1920. 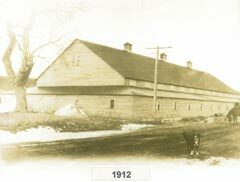 In 1925, heavy snowfall collapsed the ice rink portion of the building, but curling continued at that site until 1929. That same year, a new ice rink with three sheets of curling ice attached was built on the SW corner of Centre Avenue and Riverside Drive West, where the public library now sits. In 1948, the building was insulated to protect the ice during warm spells. Artificial ice was added in 1958, and in 1965 the club acquired its first full set of matching stones. Curling continued there until the present day facility, consisting of six sheets of ice, was built in 1983.